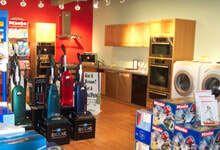 At North Shore Vacuum and Appliance, we offer sales and installations of central vacuum cleaners for Andover MA area residents and businesses. We have everything you need to create a central vacuum system, including the hoses and hard-to-find replacement parts when needed. If you are considering making the switch to central vacuum cleaners, we have everything you need - including the knowledge and experience - to make it a smooth transition. For residents and businesses throughout greater Andover MA, we offer free estimates on installation and repair services for all our central vacuum cleaners, residential and industrial. To call for a free estimate, dial (978) 774-1155 today, or stop by our shop Monday-Saturday from 9 a.m. to 6 p.m. to discuss your options. So for quality brands and superb product knowledge on all types of central vacuum cleaners, Andover MA area residents can rely on us to steer them in the right direction.